join us in person to introduce their wines to YOU. from the RHEINHESSEN wine growing area. Of course, the wines of the ULRICH LANGGUTH wines estate will welcome you too. together with our partner SUTTER from Austria. ...proved again to be a great success. 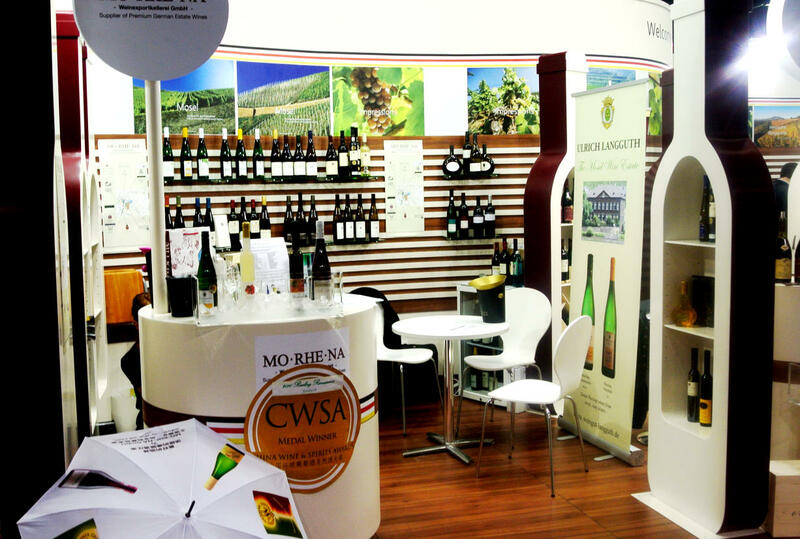 the number of exhibiting booths was less than 10% compared to Prowein. 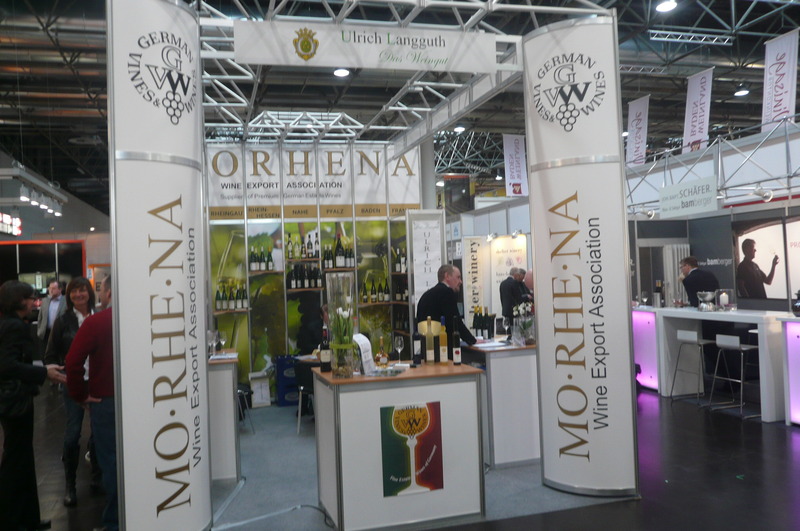 The MO-RHE-NA Wine Export company has certainly grown and expanded its activities over the last year or so. 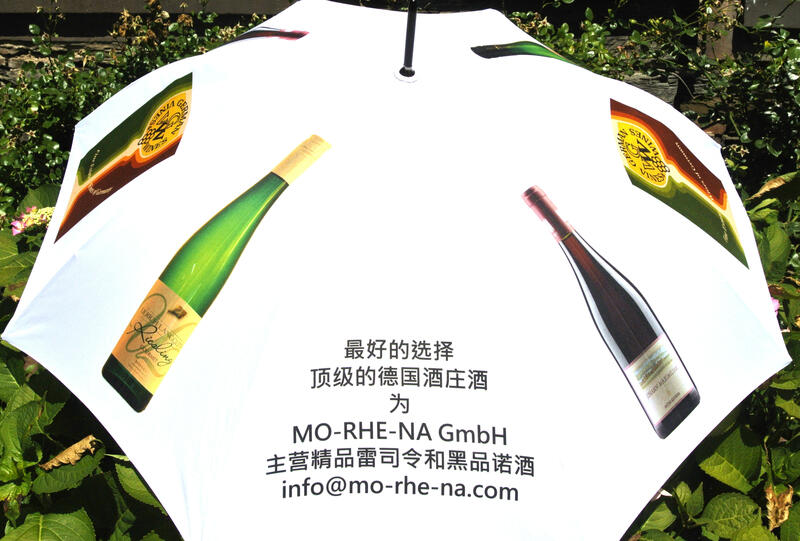 More that 25 German wine ESTATES have entrusted MO-RHE-NA and therefore its Managing Director, Patrick Langguth, with the distribution of their valuable wines. The well-known producer WELTER in the Rheinhessen areahas joined our group and we have started selling their wines in the USA. This wine estate is very competitive in relationship to prices and quality. 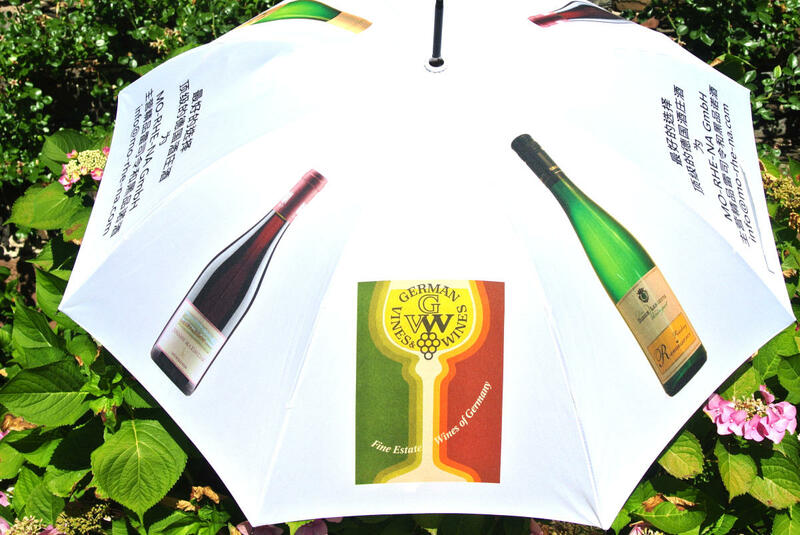 From the SAAR wine area we welcome the wine estate WÜRTZBERG. The family HEIMES has acquired these well-known, high quality 14 hectars of finest vineyards from Dr. Siemens, who in terms bought this valuable property about 10 years ago from the well known wine-maker BERT SIMON whose wines had a great reputation in the USA. We believe that we can revive the reputation of this estate abroad. We have started a cooperation with the re-knowned AUSTRIAN wine estate SUTTER. We plan to sell their wines initially in the USA and France. Their excellent choice of GRÜNER VELTLINER matches our offer perfectly. Recently the family-owned MOSEL wine estate RUEFF-RÖCHLING, situated in Enkirch, has joined our group. This old, traditonal property has a history which dates back to the 11th century. Oríginally a church property, later owned by the local counts, now run by Theo Schenk and Mr. Langen. The vintage 2016 is terminated, only small amounts of grapes remain in the vague hope to become icewine. We shall issue the results of our partner estates by January on our site for VINTAGE news. in Guangzhou. His meetings were all over very positive and promising for 2017, but the attendants for German wines as well as for other wines displayed at all exhibitions was rather disappointing. Was this due to the economy? There is no doubt that the anti-corruption laws/campaign in China has left its deep marks. Many plush restaurants as well as reknown retailers do not easily find sufficient customers for higher priced wines anymore. They need our constant support in the markets. This is certainly different in Japan or in Taiwan. We expanded our turnover and market presence of our estates in both markets. The GOLD medal awards which our estate partners received in Japan and Hong Kong as well as international reviews/ratings supported this development significantly. The Asian markets still expect wines of fruity taste, although our high class, dry wines (Riesling/ Pinots) are finding more and more awareness and recognition. We also received valuable judgments by the Jancis Robinson team for a number of our wine. We want to stress the point that more wines could be sold provided the consumer is more regularly exposed to TASTINGS of our wines. There are already great tasting machines on the market, however they are still expensive. It is our firm belief that offering wine "by the glass " in restaurants and bars as well as running tastings in retail shops is the most important way of allowing the consumer to discover new types of wines or...... to discover their OWN taste. from neighbouring China such as Shenzhen and Guangzhou area. Our focus in 2016 is now again on PROWEIN. 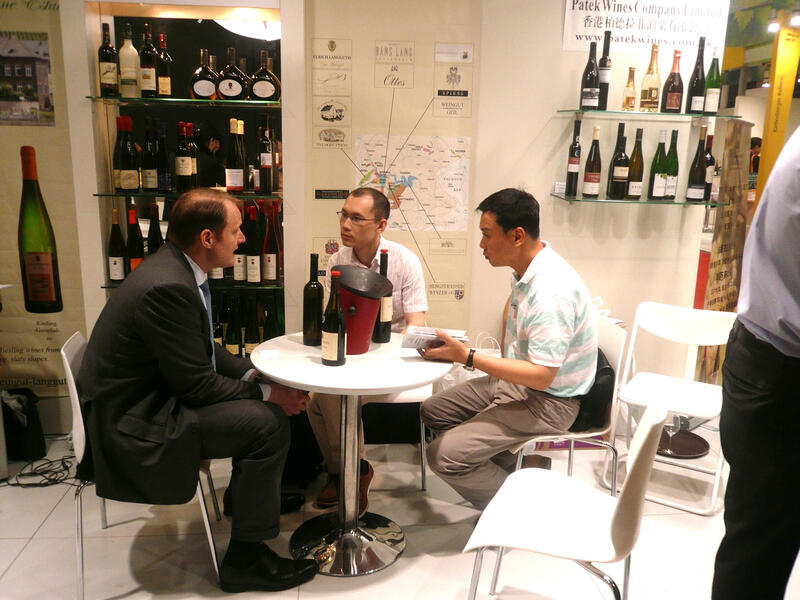 Patrick will then proceed to the most wine exhibition in Chengdu/ China where most of the most important players in the Chinese wine market will gather. In April he intends to fly to the international exhibition in Singapore in order to gain more contacts in this city but also in the neighbourhood of Vietnam, Thailand and Malaysia, countries which are developing. He will then proceed to Hong Kong, Taiwan and Japan where we enjoy an increasing success. We just received a gold medal at the Sakura wine exhibtion in Tokyo, a very important success as this wine, the Ulrich Langguth Riesling RENAISSANCE off-dry wil be distributed in the future by one of the largest importers and distributors in Japan. This report, written by Ulrich Langguth, will be constantly updated and will inform you about market situations, the development n the vineyards, on the outlook on the coming vintage as well as on political changes related to wine laws. MO-RHE-NA has continued to grow successfully and this in spite of the considerable shortage of wine which most of our partners suffered under. This shortage was due to both vintages 2012 and 2013 and only the result of the vintage 2014 vintage will solve our problem to satisfy the expectation of our customers. The US remains the No. 1 market for German fine estate wines and will continue to do so for the year 2015. The Dollar value should support this development. China, including the Hong Kong market, has become No. 2 for our wines despite the fact, that this market suffered a significant set back in 2014 due to the government anticorruption campaign since 2013. There entire wine industry had to learn that a large percentage of top class foreign wines entering the Chinese market was purchased only for the purpose to be given away as ‘gifts’. The market had been flooded by imported wines and needed to be cleared from huge stocks. The preference for RED has lost its impact and German Riesling wines are finally beginning to be recognized in taste and value for their quality. Our group ran 5 consumer promotions only last fall in Bejing, Hangzhou and Shanghai and was extremely pleased with the acceptance of our top class Riesling estate wines. However we will continue to train the sales staff of our business partners how to explain our wines and at which occasions these wines can be enjoyed – with food or by itself. PROWEIN 2015 will be our next step. You will find us in Hall 14 at booth E 95 – next entrance of Hall 13. VINEXPO 2015 in Bordeaux – we have already registered. By the end of last year Ulrich Langguth, the founder of MO-RHE-NA in 1982, decided to retire from his regular tasks for this company. He will continue to accompany the group as advisor with his experience of more than 50 years travelling abroad as well as great reputation in the German and the international wine market. He has also put the ownership and management of the Ulrich Langguth Family Estate into the hands of his two sons, Patrick Ulrich and Markus Ulrich Langguth, to continue the over 225 year old long family tradition in wine. The development in our vineyards between 1988 and last year we were talking about the change of climate and how the warmer weather effects the grapes. For the first time for many years winter has been longer and the rainy periods lasted into June with the consequence that the flowering period took place about 3-4 weeks later than in the years before. In fact, this year's flowering period just ended by July 1st which was similar to the times before 1988. We shall have to watch how the grapes develop, how many are left due to the cold period and we look forward to a - hopefully - warm month of August. The moisture is sufficient to swell the grapes in time. 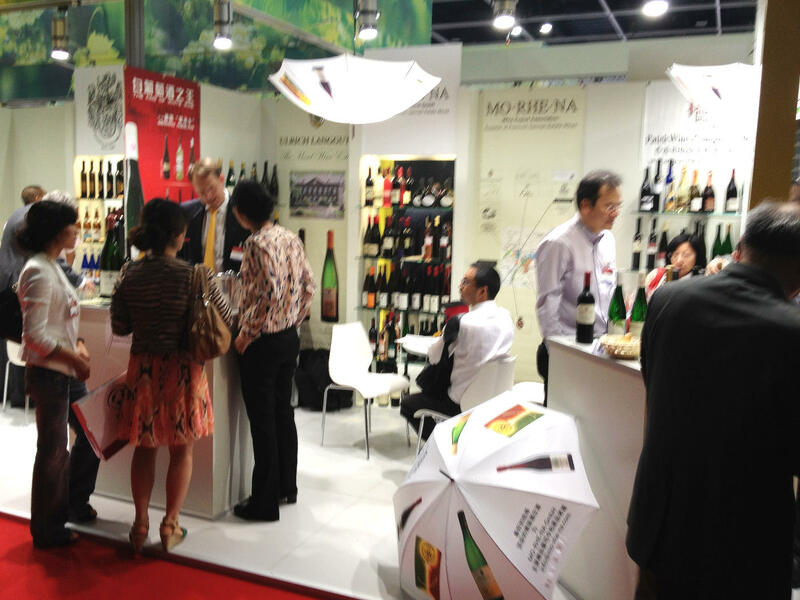 We exhibited between June 16 - 20 at VINEXPO / Bordeaux with an own booth. The success was very surprising. The number of pre-registered guests who had booked day and time for their visit was astonishing. We were also happy about many new interesting visitors from new markets such as Columbia, Venezuela, Kasastan, or Brasil which proved that the reputation of RIESLING as being the best white grape varietal is spreading around. Finally, after having applied for 3 years for the right to sell his wines wines as ORGANIC wines, Hans Lang, the re-knowned producer from Hattenheim in the Rheingau has received the permission to sell his 2012 wines under the seal of ECOVIN and the laws of the EU. Unfortunately the year 2012 did nmot prove to be a great success as botrytis caused a considerable damage to his crop as the vines and grapes could not be sprayed in usual way. In fact, The 2012 yield as the lowest since Hans Lang started as a winemaker with 42% of a normal year. However, the quality of his wines will be superb and will delight all lovers of finest Rheingau wines. How do the vintages 2010, 2011 and 2012 compare with each other? and we do believe that that some of the few top qualities will have a long shelf life. PINOT NOIR - the discovery in Germany! Had you asked me 10 or 15 years ago about German red wines I would have waved this question off the table. Today, you find some amazing red wines in the different wine growing areas. Of course, the DORNFELDER red wine, a very Germany discovery, remains the No. 1 grape in quantity, hélàs PINOT NOIR overtakes the Dornfelder in finesse and charme. You may be surprised to hear that some growers finshed up with places under the first 5 best in Pinot competitions in France and elsewhere. Hans Lang / Rheingau is certainly known for HIS great Pinots but one should also look at some of Thomas Losen's Pinots, especially the 2005 one.WEISSER BURGUNDER = PINOT BLANC, a grape varietal which is not so known out of Germany but which yields wines of great flavour. These wines can be – in contrary to Riesling – early consumed. Thomas Geil / Rheinhessen and Anselmann/ Pfalz produce some charming ones. Here again I must tell you the story which I experienced some 5-7 years ago. I was standing behind my little table promoting 6 of our wines at an international wine show at the MARRIOT at Times Square in New York. Two people came up to my table and I said with a mocking smile: What leads you to my humble RIESLING wines? Ha, Ha, retorted one of them , 'humble' Riesling, you know what we believe? The upgraded consumer in the US will soon be tired of all these Chardonnays as they taste almost all very much alike. They will first of all discover a lively Sauvignon Blanc but afterwards they will find out that there is NO other WHITE grape varietal which IS as VERSATILE as RIESLING. And, indeed, we can supply you with great DRY Riesling wines which will match outstanding fish dishes, we can supply excellent, elegant semi-dry and fruity wines which will match American cuisine and Asian dishes and, last but not least, RIESLING is also know for its outstanding dessert wines such as B.A., T.B.A. and Icewines. Which other white grape varietal can do this? WHO else reports on RIESLING? Read the excellent reports from Jancis Robinson, the well-known wine writer of London Financial Times. 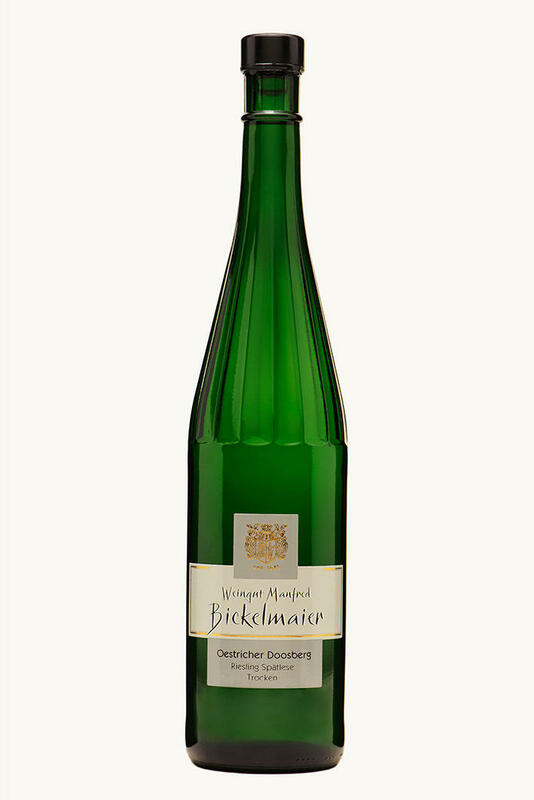 In her opinion German RIESLING wines belong to the very best white wines which exist. accross the River Mosel at Ürzig? The international press was influenced to report many negative articles on this bridge and the results apparently caused to the surrounding villages and vineyards by the construction of this bridge. These informations were produced by a small group of participants, mostly inhabitants of the village of Ürzig but also politicians who tried to profit from this campaign by opposing to this project out of envrionmental reasons. This was a rather undemocratic campaign because the project was planned some 10 - 15 years ago and was approved by all political levels, whether federal parliament, the state parliament of Rheinland-Pfalz as well as by the mayors of the villages and their deputies. All these bodies agreed and there was time enough to oppose to these plans some years ago. This last campaign has caused more bad PR effetcs than positive ones, especially as you could read in CHINA NEWS that the WHOLE MOSEL valley would be damaged........ what an exaggeration. Unfortunately some wine journalists allowed themselves to be abused as well, they should have come here and get better inside informations. The new bridge to be constructed between 2011-2013 will eveentually lead more tourists to the middle part of the Mosel which this area badly needs in absence of industry. How was PROWEIN 2012 ? We exhibited with a grand booth and were able to welcome a rising number of foreign visitors as well. PROWEIN has become the No. 1 trade show in wine, beating VINEXPO / Bordeaux. The visitors regard this show as being very efficient, well organized, to sum up it is a working exhibition. This exposition proved to be the largest and most in ternational of its kind in ASIA. It only lasts 3 days but it is very exausting. The event was absolutely invaded by Mainland Chinese. Patrick Langguth, the Man. Director, was this time in charge of the booth, assisted by father Ulrich and Elaine Yu, a Chinese Lady from Shanghai. We were happy to welcome a number of old customers as well as new visitors from Taiwan, Korea, Japan, The Philippines, Malaysia, Indonesia, India and other Asian countries. It was a cosmopolitan crowd and it made fun to meet all these people and make our RIESLING wines taste. No doubt, there is a visible shift from red wines to dry wines and RIESLING enjoys a great reputation, backed up by well-known journalists as Jancis Robinson and Jeannie Cho Lee, both Master of Wines. 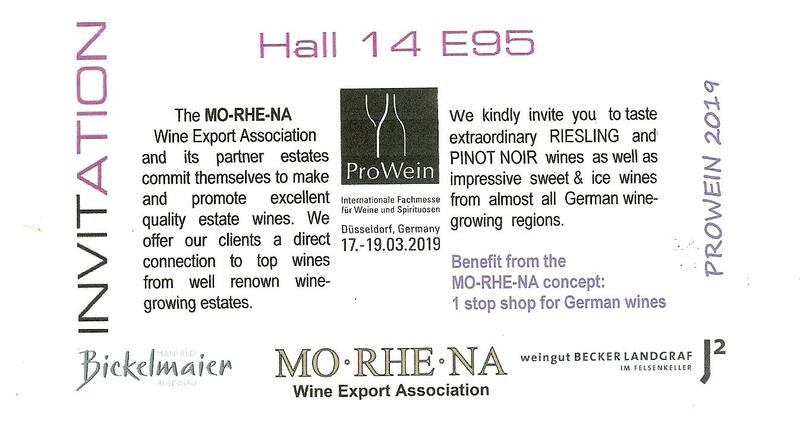 we shall again exhibit at PROWEIN in March with our booth which you see above. and last, but not least we shall partcipate for the 13th time at VINEXPO / Bordeaux in June. Can we introduce our company umbrella to you ? GREAT news beginning with January 1st, 2010. The MO-RHE-NA Wine Export Association has changed ownership! PATRICK Gero Ulrich LANGGUTH, the son of Ulrich Langguth sen. has taken over the majority of this company and has become Joint General Manager the company together with his father Ulrich. Patrick Langguth had started as a lawyer, but quickly joined the banking business where he was working in sales of corporate loans for more than 10 years. 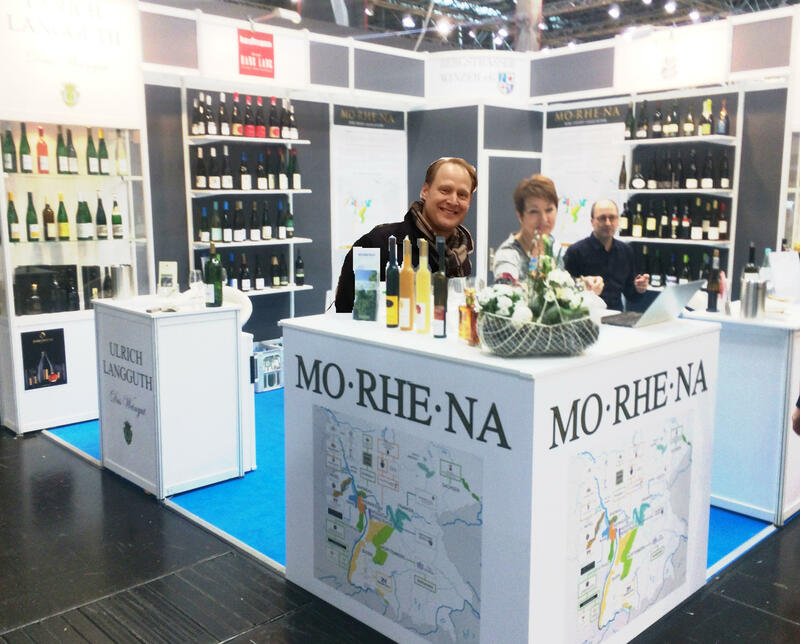 The MO-RHE-NA Company was founded in 1982 and has been owned jointly by Ulrich Langguth ( 90% ) and Hans Lang, wine estate owner in the Rheingau. We are happy to announce that the business policy of the MO-RHE-NA GmbH will be continued by PATRICK Langguth who is most interested in expanding this successful business. He will travel a lot to visit the customers of the MO-RHE-NA company and to learn what is needed on the market. Patrick has travelled intensively since the beginning of this year through Asia, visiting our contacts in Korea, Japan, Taiwan, Vietnam and Singapore. In March he started for 2 weeks trip through the US and he returned 1 day before PROWEIN opened its doors at Düsseldorf . This exhibition enjoys an ever rising number of visitors also from abroad because it takes place only 3 days and it is a working exhibition with no attractions aside as compared to Bordeaux. The German Sunday newspaper ' Die Welt am Sonntag ' printed in its issue on June 14th an interview with the ' Patriarch ' of all international wine journalists, the well-known writer Hugh Johnson.
" I tell everybody that I judge German Riesling as being the best white wine in the world. It was first of all the time when everybody ordered Chardonnay. Afterwards it was Sauvignon Blanc – which nowhere can come near to a top Riesling. " We are proud to report on his judgement because who would be in a better position to judge than the independent and well respected wine journalist Hugh Johnson ??? Until soon! Stay with RIESLING and PINOT NOIR out of Germany, it will be to your advantage!